Light and sandy soil can be a blessing, easy to dig over and work on all year. But often it will become very dry in the summer months. Browse our selection of hedging plants that are perfectly suited. Choose from our list of suitable hedging if you have dry sandy soil. Before you plant it really pays to incorporate plenty of organic matter so that the soil holds more water, and a mulch afterwards will give the new hedge the very best start. Hedges For Sandy Soil – Sandy soil in the garden can be a blessing and a curse as it is easy to dig over and will drain quickly unlike clay soil however because of these two factors it will not hold onto either nutrients or water for any length of time. By adding in plenty of well-rotted organic matter such as manure, compost or leaf mould in the initial stages of planting which is the most vital time when new hedges for sandy soil are trying to get their roots down this will to a degree ensure moisture retention as well as adding much needed nutrients into the soil. After planting a good deep mulch of bark, compost or even lawn mowings will be very useful and water regularly as necessary until the roots are established will be essential. Lavenders and Rosemary are ideal small hedges for sandy soil – as they are mediterrenean hedging plants more used to arid conditions. The Cotton Lavender hedge (Santolina chamaecyparissus) is a similar sized hedging plant that thrives in the same dry sandy conditions. All varieties of Barberry or Berberis Hedging including the deciduous varieties such as Green, Purple and Rose Glow are excellent prickly hedges for sandy soil, for evergreen species try Berberis stenophylla or Darwinii. Beech hedging plants have a deep dislike for very wet soil but are well suited to lighter soils, once established they are very drought tolerant. There are many evergreen hedging plants worth considering including Euonymus, Choisya, Cotoneaster lacteus, Box Hedging, Holly hedging – both the English holly and the smaller Japanese Holly types. 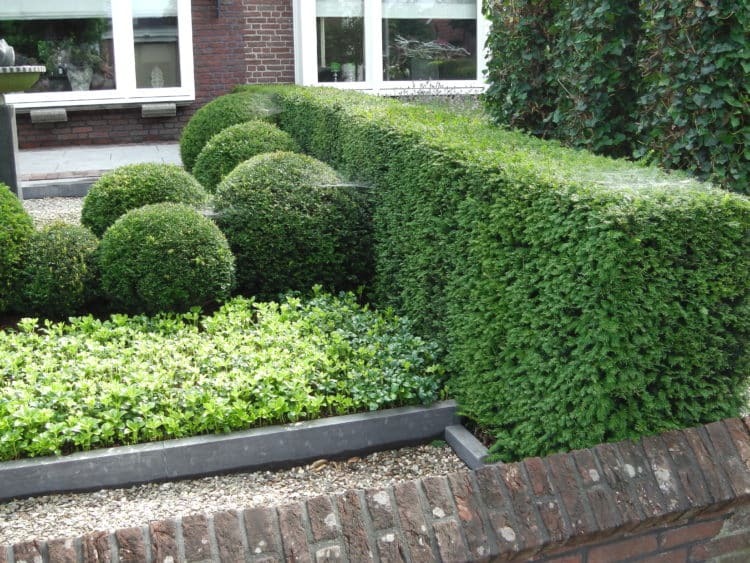 Semi evergreen Privet hedging plants are also suitable. Conifer hedges such as Leylandii hedging, the excellent and more easily maintained Thuja hedging varieties and the king of hedging plants – English Yew, will thrive in a dry sandy soil. Many flowering hedges do well in these conditions as well, Hedging Roses, Plum Hedges, Weigela, Snowberry, Hydrangea, Spiraea, Deutzia and Flowering Currant all make interesting focal points either as hedging plants or individual shrubs. Hedging shrubs with grey foliage are often well suited to dry conditions making good hedges for sandy soil, apart from the various Lavenders we have listed already, the Olearia Hedges (Daisy Bush) do very well along with Perovskia Blue Spire, Sea Buckthorn and Elaeagnus ebbingei. If you have any other questions about our hedges for sandy soil please do call our friendly and experienced sales team of hedging experts on 01580 765600 who will be happy to answer them.